Pharmacogenetics is the study of how genetic regulated variation may impact ones’ ability to respond to or develop side effects from medications. Simply put, pharmacogenetics lies at the intersection of pharmacology, clinical pharmacy, and genetics. Genetic differences in how a person might metabolize (or break down) a certain medication or how genetic differences in the shape or function of a drug receptor may affect outcome, lies at the heart of pharmacogenetic research. Despite the obvious importance and increasing clinical relevance of pharmacogenomics, some important barriers to improving the clinical utility of such knowledge exist. These include the highly complex nature of the problem, little incentive for industry to move to genomic-based approach, and lack of provider education.9 The University of Michigan College of Pharmacy's Clinical Pharmacogenomics Laboratory (CPL) was started in January 2004 to encourage and support studies into the clinical application of pharmacogenomics, and the CPL is particularly well-positioned to overcome these barriers in its work to bring pharmacogenomics to the clinical setting. Research involving investigators with both clinical practice and pharmacology/ pharmacokinetics expertise is more likely to ask the appropriate questions and account for important confounders, while at the same time keeping the overall goal of clinical application/utility in focus. Further, there is considerable incentive for this group of clinician-researchers to bring these scientific advances to the patient bedside, and with a background in both the science and clinic applicability of pharmacogenomics, the CPL is in an optimal position to educate providers regarding this field and its utility. Spear BB, et al. Clinical application of pharmacogenetics. Trends Mol Med 2001;7:201-4. Lazarou J, et al. Incidence of adverse drug reactions in hospitalized patients. JAMA 1998;279:1200-5. Sachidanandam R, et al. A map of human genome sequence variation containing 1.42 million single nucleotide polymorphisms. Nature 2001;409:928-33. Evans WE. Pharmacogenomics: marshalling the human genome to individualise drug therapy. Gut 2003:52 (Suppl II):ii10-ii18. Ozdemir V, et al. Evaluation of the genetic component of variability in CYP3A4 activity: a repeated drug administration method. Pharmacogenetics 2000;10:373-88. Phillips KA, et al. Potential role of pharmacogenomics in reducing adverse drug reactions: a systematic review. JAMA 2001:286:2270-9. Given the CPL's focus on translational research, or the transfer of basic science or laboratory-based research to the clinical setting (and vice versa), the CPL offers a variety of both laboratory-based and clinical research services as outlined below. With regards to the above types of projects, CPL services can include any or all of the steps from refinement of a study idea to grant application to conduct of study to publication and dissemination of the results. Additionally, with more than 30 Department of Clinical Sciences clinical faculty members as potential collaborators, the CPL is capable of carrying out clinical pharmacogenomic studies in a diverse array of adult and pediatric patient or healthy volunteer populations. The Clinical Pharmacogenomics Laboratory (CPL) at the University of Michigan College of Pharmacy is led by Dr. Ellingrod, and is fully equipped for the processing and analysis of biological samples, primarily focusing on single nucleotide polymorphisms (SNPs). The mission of the CPL is to facilitate pharmacogenetic research within the University of Michigan community and beyond. 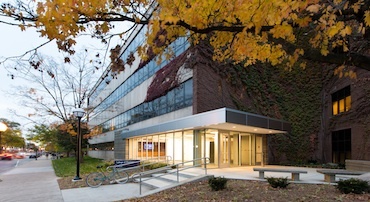 The College of Pharmacy is located within walking distance of the medical campus, with close access to the faculty and resources at the University of Michigan Medical Center, the Life Sciences Building, and the Medical Library. In addition to the analytical laboratory space, the research investigators have unlimited access to both a cold-room within the College and a dark-room equipped with an automated film development unit for immunoblot development. Samples can be prepped for rt-PCR, flow cytometry, and DNA sequencing as they relate to pharmacogenetic work. Two autoclaves are also available in the pharmacy building.